This site is located where the Dead and Hillsborough Rivers converge. From Monday to Thursday, park along on the entrance road where the pavement ends and hike/bike the final 1.8 miles into the site. From Friday to Sunday, visitors are allowed to drive all the way in. The entrance road, the 2-mile multi-use trail and the river views all provide lovely birding, especially during fall migration. Wood-warblers like Golden-winged, Blackpoll and Magnolia have been spotted as well as Indigo Bunting, Gray-cheeked Thrush and Acadian Flycatcher. Resident species include White-eyed Vireo, Pileated Woodpecker and Carolina Chickadee. Overnight youth campers may use the 0.25-mile nature trail south of the campground (reservations required). 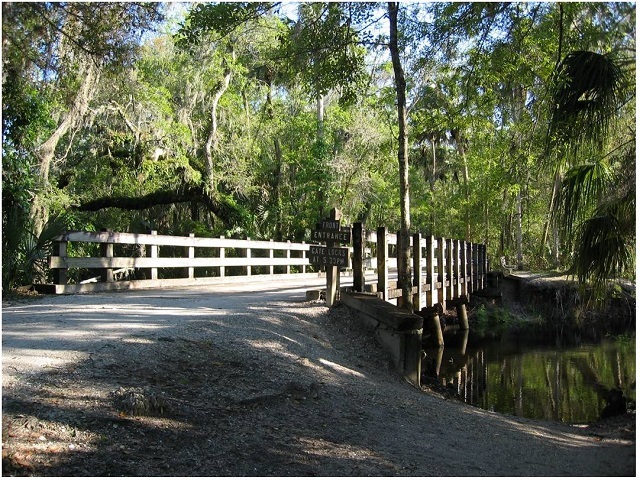 The park is another access point for the Hillsborough River State Canoe Trail; Hillsborough River State Park is an easy upstream paddle; go 3 miles northeast to the park and float back down, enjoying the wildlife as you drift along. Downstream is the difficult Seventeen Runs section of the water trail, for experienced paddlers only.